The 1961 World Series matched the New York Yankees (109–53) against the Cincinnati Reds (93–61)….with the Yankees winning in five games to earn their 19th championship in 39 seasons. This World Series was surrounded by Cold War political puns pitting the “Reds” against the “Yanks”. But the louder buzz concerned the “M&M” boys….Roger Maris and Mickey Mantle….who spent the summer chasing the ghost of Babe Ruth and his 60 home run season of 1927….as Mantle finished with 54….while Maris set the record of 61 on the last day of the season. With all the attention surrounding the home run race, the World Series seemed almost anti-climactic. 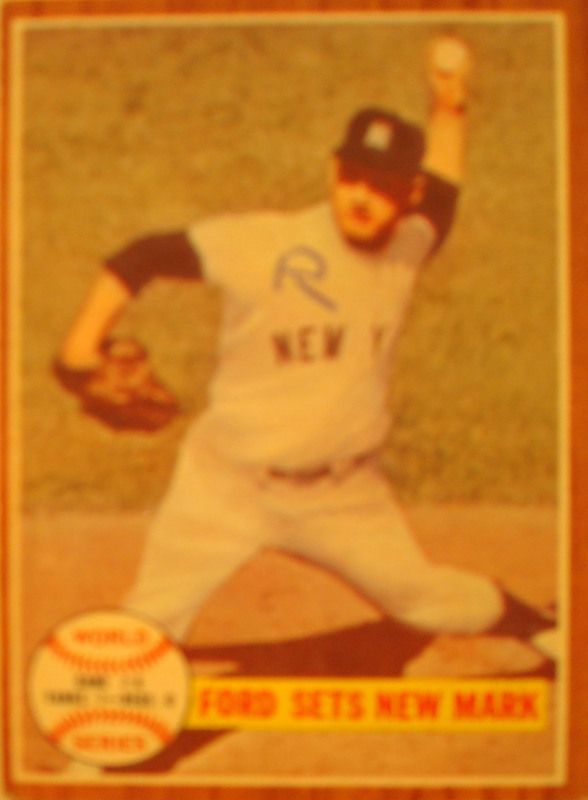 The Yankees were under the leadership of first-year manager Ralph Houk….who had succeeded Casey Stengel. 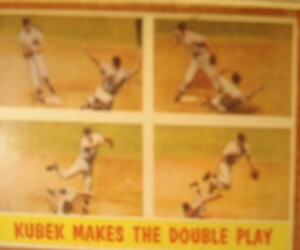 The Yanks won the American League pennant….finishing eight games better than the Detroit Tigers. 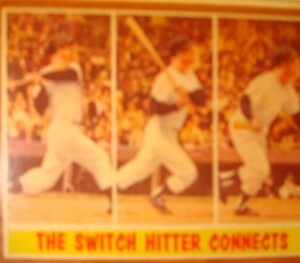 The Bronx Bombers also set a Major League record for most home runs in a season with 240….that’s cuz along with Maris and Mantle….four other Yankees….Yogi Berra, Elston Howard, Bill Skowron, and Johnny Blanchard….hit more than 20 home runs. The pitching staff was also solidified by Cy Young Award-winner Whitey Ford (25–4, 3.21). The underdog Reds….skippered by Fred Hutchinson….finished four games ahead of the Los Angeles Dodgers in the National League….and boasted four 20-plus home run hitters of their own….NL MVP Frank Robinson, Gordy Coleman, Gene Freese and Wally Post. The second-base, shortstop, and catcher positions were platooned….while center fielder Vada Pinson led the league in hits with 208….finishing second in batting with a .343 average. 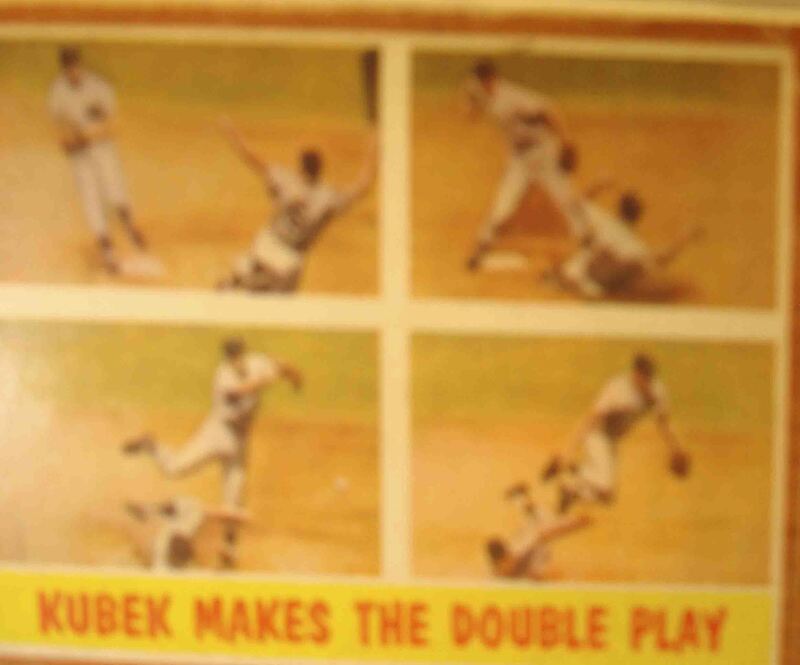 Joey Jay (21–10, 3.53) led the staff….along with dependable Jim O’Toole and Bob Purkey. The Series MVP went to lefty Whitey Ford….who won two games while throwing 14 shutout innings…..however, Ford left the sixth inning of Game 4 due to an injured ankle. 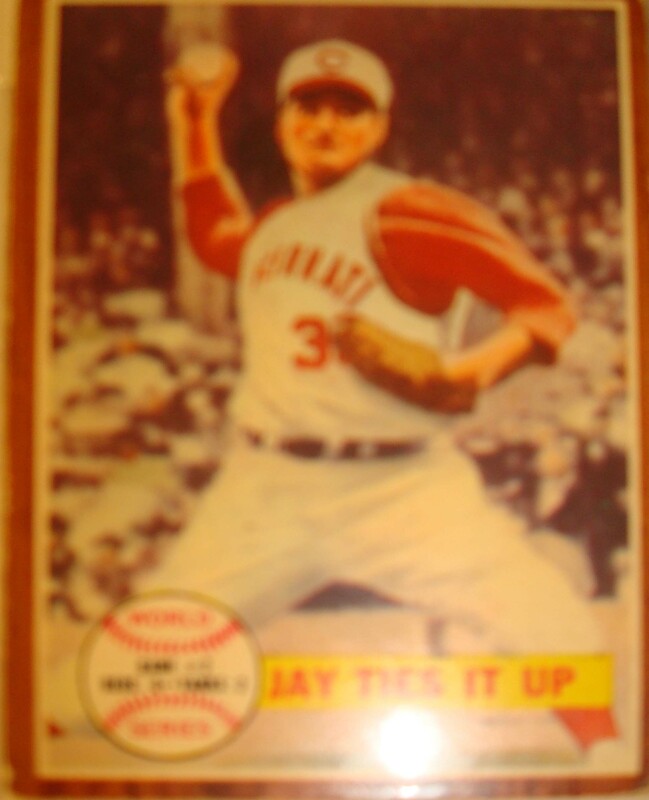 He set the record for consecutive scoreless innings during World Series play with 32….when, during the third inning he passed the previous record holder, Babe Ruth, who had pitched 29 2⁄3 consecutive scoreless innings for the Boston Red Sox in 1916 and 1918. 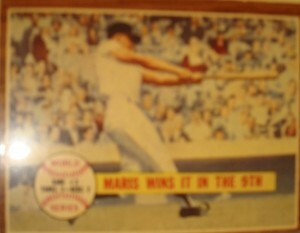 Ford would extend that record to 33 2⁄3 in the 1962 World Series. The 1961 five-game series was the shortest since 1954….when the New York Giants swept the Cleveland Indians in four games. 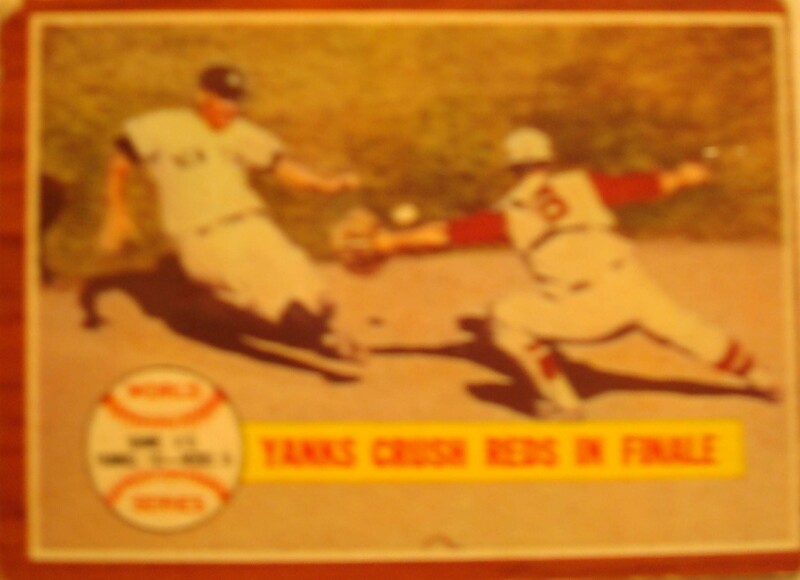 MLB – Original Baseball Card 1961 NY Yankees vs Cincinnati Reds in WS Game 5 win. 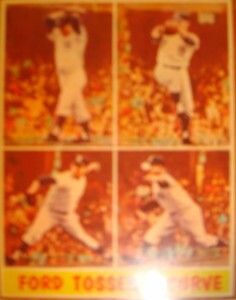 MLB – Original Baseball Card 1961 NY Yankees w Clete Boyer, Billy Gardner & Hector Lopez celebrating. MLB – Original Baseball Card 1961 Cincinnati Reds P John Jay on way to Game 2 WS win. MLB – Original Baseball Card 1961 NY Yankees CF Mickey Mantle connecting in WS Game 5 win.